It cannot be overstated how much this design stands out among its competition on the shelf. A master class by the great Paula Scher in how less can be so much more. More info here. Close your eyes. Now, try to imagine how this box front could be any worse. (If you’re still reading, your eyes are supposed to be closed.) Now, open them. That’s right, this is still worse. Don’t feel bad, it means your imagination isn’t evil. 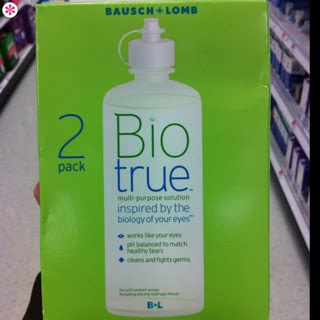 Thanks to P*S* Reader and iPhone user Mat Dubord for the Biotrue submission. Even though the designer in me wants to buy the BioTrue the Opti-Free is much better for your eyes! I have always loathed buying the product because the packaging is so bad! Some things must be borne I suppose.